After I heard Max Gerson Therapy from the local radio talk show, I have researched on Dr. Max Gerson, MD and his life, and right away been drawn to this amazing therapy. Diet and nutrition has been considered as a kind of more important mothod in treating disease or as important as the medicine itself, in fact, herbal medicine and food come for the same origin in Eastern medicine. 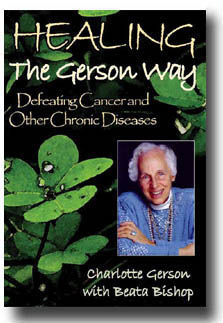 Exerpt from Healing the Gerson way: Unlike his contemporary and opponent, Antoine Bechamp, who claimed that what mattered was not the germ but the condition of the organism which it attacked, Pasteur stuck to his dogma until the very end. Only on his deathbed did he admit that “the germ is nothing, the terrain is everything.” Unfortunately, this late change of mind has remained largely unknown, leaving modern medicine in the trap of the germ theory, the neglect of the “terrain” and relentless specialization. In Eastern medicine, Practioners, believing in the human body’s healing system, do not treat the symptoms but the underlying cause, which can be the terrain as the exerpt above. therefore once we removed all the molds and dusts and clean up the room, there will be no more bad smell or fungus and make you good sleep and life and the same goes to the cancer patient, when he or she cleanses or detoxifies his or her body and restore the healing system completely, there can’t be any recurring cancer. I really enjoyed this book, although not the whole book, some part, you can skip however overall I’d like to give four out of 5 stars to Healing the Gerson way. The readers will find many helpful tips of health and longevity closely intertwined with Nutrition, Diet and Environment, even though looking for the cure of diseases or maintenance of the good health. After I posted this, I met a man at the same church to ask how his young daughter is doing with the cancer and recommend the Gerson therapy. And he’s already been there in Mexico with his daughter and found that wasn’t really helpful. I could tell what he saw and felt from the way of his talking, yes her daughter has already had chemo and radiation therapy and by the Gerson therapy, which is more difficult to be treated due to the heavy toxins and damaged liver functions and now we all know there is no panacea and the Gerson therapy is not always succefull in treating cancers. Most of all, although there are your oncologist, your family and frineds, You, the patient, are the one to make a best decision and follow the therapy with a knowledge of that cancer you are presently fighting with.